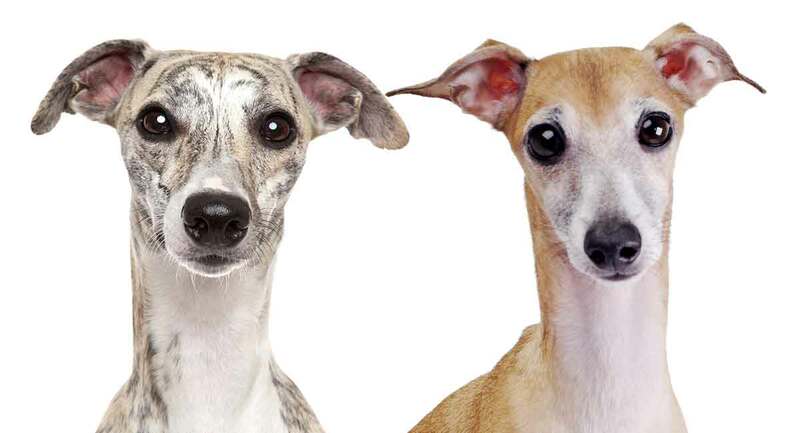 Whippet Vs Italian Greyhound – Which Speedy Breed Is Right For You? You are here: Home / Breeds / Pure / Whippet Vs Italian Greyhound – Which Speedy Breed Is Right For You? Are you comparing the Whippet vs Italian Greyhound? Which breed would make the best pet for you? How do their size and personality compare? Is one healthier than the other, or easier to train? Everything you need to know about Whippets Vs Italian Greyhounds is coming up! The Whippet and the Italian Greyhound look very similar, even to experts. However, they are two different breeds that share a similar history. They were used by hunters and racing enthusiasts in England who were unable to afford to own larger Greyhounds. Experts are still unsure exactly which breeds were crossed to create the Whippet, however, the breeding was quite successful. The Whippet quickly became a popular hunting dog and racing hound in England and all the way to America. But what about the Italian Greyhound? It may come as no surprise that the Italian Greyhound is also a descendant of the Greyhound. But he is miniature in stature and he was bred for different purposes. The Italian Greyhound is an ancient breed developed as a companion dog nearly 2,000 years ago, during the rule of the Roman Empire. The breed continued to be a status symbol for nobleman and royalty for centuries. However, it is also thought that these Greyhounds were used as hunting dogs for small game. Whippet and the Italian Greyhound do look quite similar. But the Whippet is larger than the Italian Greyhound. Standing approximately 18 to 22 inches tall and weighing 25 to 40 lbs, the Whippet is a lean, long-necked dog with short ears that fold over. They also sport a long tail, alert eyes, and a long, pointed muzzle. How does the Italian Greyhound compare? The Italian Greyhound is also lean, with similar features, such as short floppy ears, a long tail, and expressive, alert eyes. However, they are quite a bit smaller than their Whippet counterpart, standing only 13 to 15 inches tall and weighing just 7 to 14 lbs. Both the Whippet and the Italian Greyhound are agreeable, cheerful companions and do well with children and other household pets. They rarely show aggression and enjoy their families. However, they are descendants of racing dogs. They are famously agile, as well as intelligent. Therefore, prospective owners should note that both of these breeds are prone to sudden bursts of energy outside the home. Whippets especially are mischievous escapes artists and even known climbers. For this reason, backyards should be securely fenced. You’ll also need a rock solid recall for walking your dog off the leash. We recommend early socialization and obedience training for all pups. Both will help to ensure your Whippet vs Italian Greyhound puppy, whichever one you choose, will grow up well-adjusted and happy. The Whippet and the Italian Greyhound can be shy with strangers. That’s why early socialization and obedience training are so important for both of them. Both breeds, but especially the sensitive Italian Greyhound, will respond best to training methods that involve positive reinforcement. Use treats and praise in daily training techniques to teach you Italian Greyhound or Whippet good manners. Smaller dogs can sometimes be more difficult to potty train. Their small bladder might need emptying more often, and they can have accidents in the house which go unnoticed because the volume is small. For ideas on how to potty train your Whippet vs Italian Greyhound, visit this article. Crate training is another great skill to practise with Italian Greyhound or Whippet puppies. Using a crate makes it easier to keep them safe when you have to leave the front door open. These high speed dogs won’t hesitate to bolt after a cat, squirrel, or even a car which they see fly past an open door. Exercise is important, especially for two breeds who are descended from a well-known racing dog. Whippets are calm and reserved when they are inside their home with their family, but don’t be fooled. This is a breed can take off at the drop of a dime and will need proper exercise to harness that energy. The Italian Greyhound can also be a runner, although he is smaller than the Whippet and will not need as much exercise. Still, both the Whippet and the Italian Greyhound need a brisk walk and plenty of play times every day. Exercise could include trips to the dog park, playing a game of Frisbee, or taking a nice walk or jog around the neighborhood. Along with proper exercise and a healthy diet, your Whippet and Italian Greyhound should undergo early health screening to obtain an idea of any health issues he may face in the future. Keep in mind that most reputable breeders perform health screening of their puppies’ parents and offer certificates proving this. Still, it is always wise to pay attention to the genetic health issues that your potential breed could be predisposed to. and the blood clotting disorder von Willebrand’s disease. The American Kennel Club (AKC) also notes that the Whippet and the Italian Greyhound are “skinny” breeds by genetics. Overweight Whippets and Greyhounds are at risk of skeletal and muscular issues. A proper diet includes high-quality dog food that is formulated for these breeds specific to body weight, activity level, and age. Of course, grooming matters as well. Luckily, both the Whippet vs Italian Greyhound are easy to groom. They only need occasional brushing and bathing with a high-quality dog shampoo. The Italian Greyhound is prone to dental issues and needs his teeth brushed regularly. Both breeds need their nails trimmed on a regular basis as well. In addition, check and clean their ears regularly to prevent infection caused by wax and moisture buildup. Whippet Vs Italian Greyhound – Which Breed Makes a Better Pet? The Whippet vs the Italian Greyhound are similar to one another, so how do you decide between the two? If you are a family with young children, you may want to consider getting the Whippet, as they are larger and sturdier than the Italian Greyhound. However, keep in mind that children must be gentle with both breeds. They can be susceptible to broken bones quite easily. The Whippet has a bit of mischievous streak and can be an escape artist, so your home and backyard will have to be “Whippet-proofed” before you get this breed. The Whippet may also require a more exercise than the Italian Greyhound. If you love both of these breeds but are concerned about health issues cropping up after adopting a puppy, you might consider adopting from a shelter. Adopting an adult Whippet or Italian Greyhound from a shelter has a number of benefits, including more predictable health. Price is also another benefit to adopting. Adoption fees are a fraction of what most breeders of Whippets and Italian Greyhounds charge. On average, most adoption fees are usually around $50 to 100 while breeders can cost $500 to 1000, or more! However, one of the great things about going through a breeder is that they will have often health screened their litters. Any reputable breeder will be able to provide you with certificates proving their dogs are good to go home with you. If you would like more information on how to go about adopting a dog from a shelter, visit us here! Do you know of any amazing shelters our readers should look into? If you know of any great shelters in the US, UK, or Australia, leave us a note in the comments section below! Clark RD. Medical, Genetic & Behavioral Risk Factors of Whippets. Frink EJ et al. 1992., The Effects of Sevoflurane, Halothane, Enflurane, and Isoflurane on Hepatic Blood Flow and Oxygenation in Chronically Instrumented Greyhound Dogs. Anesthesiology. Howell TJ,et al. 2015. Puppy Parties and Beyond: the role of early age socialization practices on adult dog behavior. Veterinary Medicine: Research and Reports. Ackermann L. 2011. The Genetic Connection; a Guide to Health Problems in Purebred Dogs, Second Edition. Coren S. 1994. The Intelligence of Dogs.